While Nigeria’s ruling party handed an indefinite suspension on Rochas Okorocha for supporting the governorship candidate of another party, it has not applied the same sanction on Rotimi Amaechi for doing something similar. The APC, however, justifies its action, saying the issues of the two officials, though similar, are different. In Imo, Mr Okorocha backed Uche Nwosu of the Action Alliance against Hope Uzodinma of the APC. Both candidates, however, lost to Emeka Ihedioha of the PDP. In Rivers, the Supreme Court barred the Independent National Electoral Commission (INEC) from accepting candidates from the APC because of internal wrangling between two factions of the party. One APC faction in Rivers is loyal to the Minister of Transportation, Mr Amaechi, and another loyal to Magnus Abe, a senator. While the APC headquarters in Abuja recognised Mr Amaechi’s faction, Mr Abe’s appealed the decision in court which eventually led to the Supreme Court decision. When the APC realised its legal challenge to its disqualification by INEC had reached a dead end, Mr Amaechi urged party loyalists in Rivers to vote for the candidate of the African Action Congress (AAC), Biokpomabo Awara. The AAC was unknown to many state residents until days to the election. Speaking on its decision not to suspend Mr Amaechi, the National Publicity Secretary of the party, Lanre Issa-Onilu, said that the minister had not engaged in any anti-party activities. He disclosed this Wednesday at an interactive session with reporters in Abuja. “Though the APC does not have governorship candidate in Rivers, the people of the state were very important to the party,” he said. “Whatever has happened in Rivers, and whatever Rotimi Amaechi has done, is completely normal and acceptable to this party,” the official said. 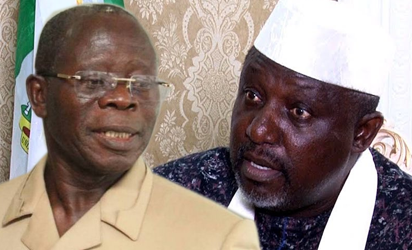 Mr Okorocha, the outgoing governor of Imo State and Governor Ibikunle Amosun of Ogun State were suspended by the APC two days after President Muhammadu Buhari was announced the winner of February 23 Presidential polls. PREMIUM TIMES reported how the National Working Committee (NWC) of the APC suspended the two governors for anti-party activities after a meeting. The two governors were suspended for backing governorship candidates of other parties. Mr Amosun backed Adekunle Akinlade, the governorship candidate of the Allied Peoples Movement (APM) against APC’s Dapo Abiodun while Mr Okorocha supported his son-in-law, Mr Nwosu, against Mr Uzodinma of the APC. While the APC still won the Ogun governorship election, it lost that of Imo to its main opposition, PDP. On Wednesday, Mr Issa-Onilu reiterated that Mr Okorocha remains suspended from the APC and the party would not intervene in his dispute with INEC over Mr Okorocha’s senatorial election. The collation of results and other activities for Rivers State governorship and other state parliamentary elections was suspended on March 10 following widespread report of violence and other forms of intimidation that prevented electoral officers from seamlessly performing their roles. The commission said Nigerian soldiers and armed gangs contributed to the charged atmosphere that made it difficult for electoral officers to continue with collation at the state INEC headquarters in Port Harcourt, the state capital, prompting the suspension of all electoral processes on March 10. The postponement drove a wedge between major political parties and INEC, with the Peoples Democratic Party and the APC warning against subversion of the people’s will at the ballot box. INEC has fixed the continuation of the collation and announcement of results in Rivers between April 2 and 5. Supplementary elections will take place on April 13 in local government areas where elections could not hold. The commission said it will hold security meeting in Rivers State on March 29.